While ship recycling topic suggests the end of life cycle of ships, it is in fact related to the whole life cycle of the ship. Some aspects to be considered in ship recycling are the legislative background, practical experience gained and the risks that stakeholders might face. When talking about conventions for ship recycling, we might ask ourselves why a convention is necessary. Most of us have probably seen the pictures of ship recycling facilities in South Asia, where people are walking in mud barefooted, in actually inacceptable conditions. There are actual reports of the health and safety conditions of these facilities and they could be described as “hell on earth”, so the footages are not lying. On the other hand, there is an increasing public awareness nowadays and no practicable international legislation so far. Therefore, something must be done about ship recycling. There is of course, the Hong Kong International Convention for the Safe and Environmentally Sound Recycling of Ships, developed in 2009, but unfortunately not yet entered into force, as only five countries have signed it and with yet no ratification at all. But hopefully, there might be a step forward in the future. Hong Kong Convention is applicable to all merchant ships above 500GT and to all ship recycling facilities. The key issues of the Convention are Inventory of Hazardous Materials and Authorization of Ship Recycling Facilities. The Convention contains a guideline for the development of Inventory of Hazardous Materials (IHM) and guidelines for safe and environmentally sound ship recycling. The IHM is a Documentation of Hazardous Materials possibly on board of ships. For the preparation of an IHM, there are different methods for new buildings and existing ships. With the Honk Kong Convention not being in force yet, we are in fact mostly working accoring to the requirements for existing ships. 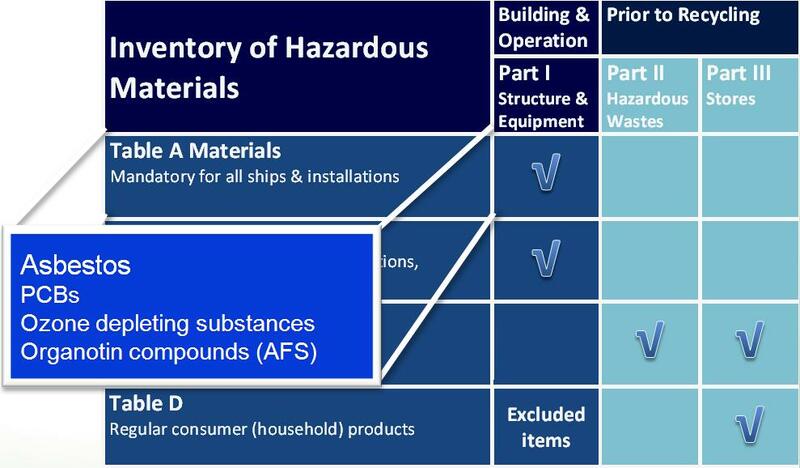 There are three different IHM parts, whereby Part I of the IHM is most important as it deals with the ship in operation and from that we are dealing mostly with Hazardous Materials displayed in the table, mainly with asbestos. There are mainly three reasons for preparation of IHMs. For new ship buildings, they are prepared according to requirements for existing ships, as the shipyard wants to be compliant with contractual requirements of ship owner. On the other side, the ship owner can claim rework before ship’s delivery from the ship, for example if the owner orders an asbestos free ship. The IHM for existing ships are being prepared in compliance with requirements of environmental labels such as the German ‘Blauer Engel’. The ship owner can also claim rework during warranty period of the ship. Last, there are IHM for ships to be delivered to Ship Recycling Facility, which are quite rare actually; in the circumstance IMO-compliant green recycling is being asked. As for IHM for new ships according to the Hong Kong Convention, the shipyard is to prepare the IHM, based on information delivered by suppliers in form of Suppliers Declaration of Conformity (SDoC) and Material Declaration (MD), for each product. This as you can imagine, is a very time consuming process and not yet in the suppliers agenda. On the other hand, an IHM for existing ship is to be prepared by the shipowner, therefore a “Hazardous Material Expert” is involved. The ship recycling facilities require obviously occupational health and safety, people involved need to be trained, and have to use Personal Protective Equipment (PPE). The ship recycling yard must be able to handle Hazardous Materials (HazMats) in a safe way and store them in disposal facilities. The IHM is there to match ship and ship recycling facility and is obviously important for detailed planning of the ship recycling. As the Hong Kong Convention is not in force yet and probably not be for several years to come, the EU started to draft their own proposal for a regulation of the European Parliament and of the Council on ship recycling. The Draft report contains a ship recycling plan for all EU ships going for recycling and an inventory of hazardous materials for all ships calling at EU ports. Something that was heavily discussed recently was a financial mechanism to finance environmentally sound ship recycling. 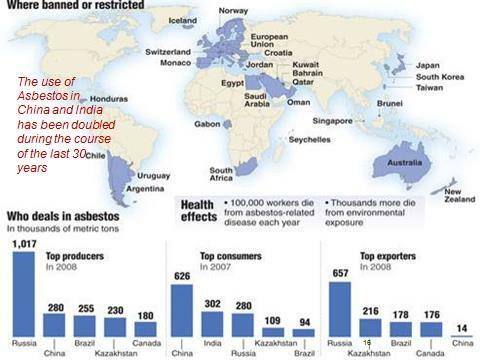 From my own experience, most people are concerned about asbestos. There are indeed regions were asbestos is banned, but not as much as desired as shown in the picture below. 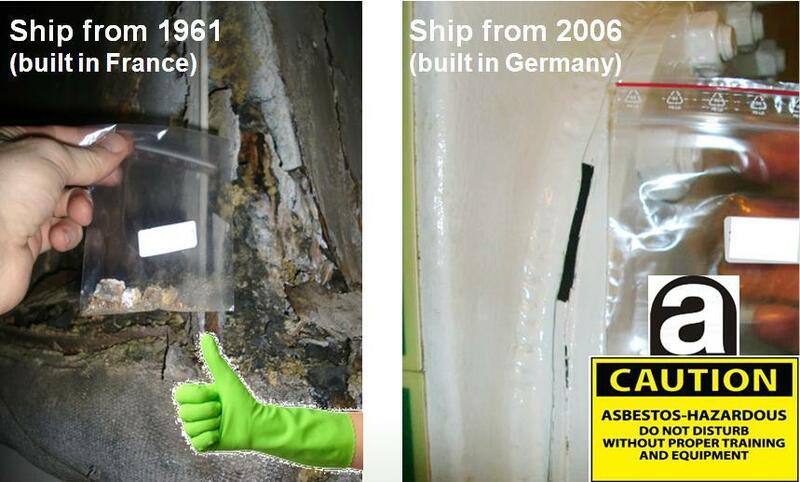 Asbestos is still being or has been used in about 3.500 products, so new buildings often still do contain Asbestos. The areas where asbestos is usually found can be quite extent. If you have to exchange that, it will most probably be very costly for the stakeholders. The challenges involved in ship recycling come from the globalization of supply chains, as banned materials are still used in shipping industry and asbestos is not banned in many countries. Another important issue for ship owners is that Port State Control in Australia and Netherlands may lead to detentions and penalties. In case inspections made on board result in finding Hazardous Materials, this could bring financial implications and difficulties to find new charterers. The shipowner therefore, has highest risks as he owns the ship for a long period of time and lacks of control of suppliers of shipbuilder. However, the ship owner is also the decision maker and can change industry as a client of shipyards, suppliers and classification societies. The best thing to properly deal with the mentioned risks and dangers is to conduct inspections and samplings for identification of wrong declarations and control of new ships prior to delivery from the shipyard. Ship Recycling is actually not only for old ships, it´s from cradle to grave! Above article is an edited version of Mrs Jessica Röttmer, Ship Recycling Expert at GSR Services, presentation during the 2013 GREEN4SEA Forum. Click here to see relevant video. 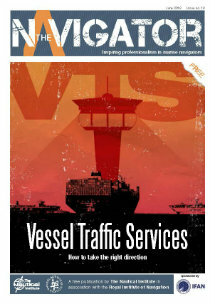 The article was initially published in SAFETY4SEA.